Two of my classmates, Eliot Caroom and Lakshmi Gandhi, produced a multimedia package for Newsweek on the Quaker vote in Philadelphia, Pennsylvania. You can find the video and story here. Last Sunday, on my way home to southern New Jersey to attend a funeral, my brother and I stopped off at the pizza place around the corner from me. I pulled out my wallet, ready to pay, when my brother, the gentleman he is, paid for me. I put my wallet down on the counter, and sprinkled some crushed red peppers on our slices. I left, pizza box in hand. Fast forward to an hour later, when I start digging through my oversized purse to pay for my bus ticket at Port Authority, to find, no wallet! As I rewinded my actions in my head, I realized that I left my wallet on the counter of the pizza place. We needed to leave, so, my brother paid for my ticket, and we left. I called the pizza place while we were waiting, but they had found no wallet. Convinced someone had taken the wallet I stupidly left on the counter, I called my bank and canceled my debit and credit card. Despondent, I laid back and prepared for the three hour ride to Atlantic City. I woke up two hours later as we were cruising down the parkway. I checked my phone for the time to realize I missed a call from my roommate. She left a message. A message that said a girl that lives in the apartment down the hall from us returned my wallet – money and credit cards in tact. She told my roommate she found the wallet in the hallway of our building. I don’t know how that happened. I know I had my wallet at the pizza place. Anyway, I came home on Monday to a wallet with everything in it. So, whoever you are, thank you! I owe you more than you will ever know! If you ever read this, email me, tell me the story, and I’ll buy you a beer or three! 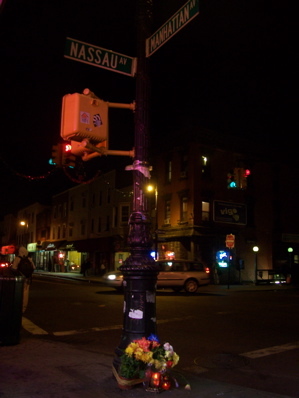 Two candles encased in red glass, one with a gold cross imprinted on the front, burn in front of a lamppost on the corner of Nassau and Manhattan avenues in Greenpoint as a memorial to Stanislaw Mazur. Mazur, 53, of River Edge, N.J., died on October 24 from blunt impact to the head that caused his skull to fracture and his injured brain to hemorrhage. The medical examiner ruled the cause of death a homicide, according to medical examiner’s spokeswoman Ellen Borakove.